Welcome to Emmanouela Studios Santorini, our family run holiday hotel, located in the traditional village of Karterados, just a stroll from the main town of Fira, the capital of Santorini island, and just 3 km from Monolithos beach. 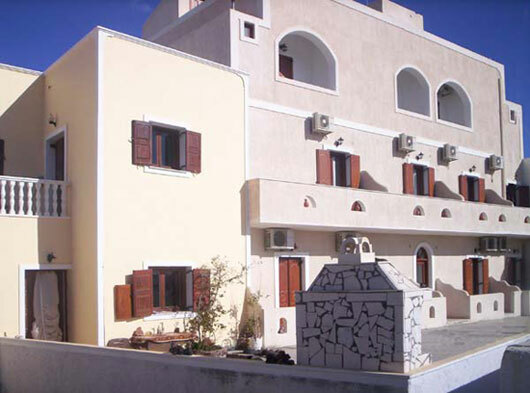 Our hotel provides a variety of cheap and budget accommodation in Santorini Karterados, such as studios, apartments and rooms for rent, which cater to couples, groups of friends, or families, depending on the specific needs of our guests. A wide array of services and facilities are available nearby, including the swimming pool in our sister hotel located just a 500 m far, the main bus stop located only 5 minutes walk from the hotel, restaurants and fish taverns, travel agencies, car & scooter rentals, and more. The location of the hotel is ideal, the building is situated in a convenient corner away from the noisy traffic and crowds, while the island’s unparalleled nightlife venues, with dozens of bars, clubs and cafés packed with visitors from all over the world are just a short walk away. Emmanouela Studios offers its guests the traditional greek hospitality with all modern comforts to make your stay pleasurable and carefree! Except where otherwise noted, content on this site is licensed under Emmanouela Studios Santorini. Emmanouela Studios Santorini has been created by Santorini Greece & Mykonos Web Solutions.